The world may know her as an antiwar leader, a fearless Plowshares activist and the wife of Phil Berrigan, but to her children Liz McAlister is simply mom — and a fierce one at that. My mom is fearless. No, really, I mean it. When my brother and I were little, we got our bikes stolen a lot. We were easy marks — pudgy, white and well-meaning, living in a tall crowded row house full of white, well-meaning people. “Hey shorty, lemme hold that bike.” We would “share” and the bike would be gone. We were always afraid to go home without our bikes because it meant getting into the car with mom and searching the neighborhood. We begged her to just buy us new bikes, but it never worked. No matter how big and intimidating the boys who “held” our bikes were to us, they seemed small and looked like kids as they handed our bikes back to our mom after mutely enduring her tongue scouring. They might have mumbled or glared as she stowed the rusty old third hand bikes in the back of the car, but they did it quietly and behind her back. It was not just neighborhood toughs-in-training who endured our mom’s fearsome mom-ness. 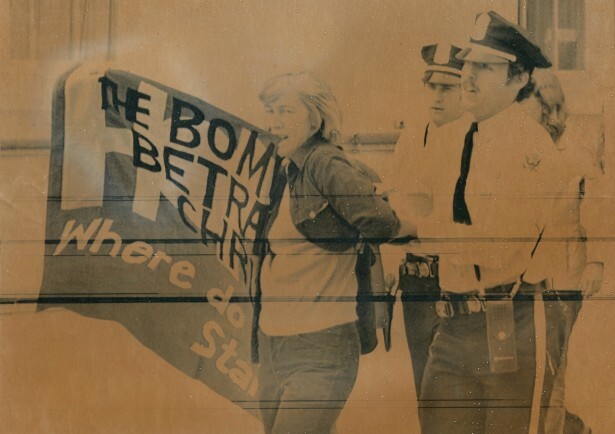 Once, demonstrating against war and nuclear weapons at the White House, mom held on to the end of the banner with her teeth as the police put her in handcuffs. She is tough, but as kids we also watched her joke with the Pentagon workers and the police a lot. Handing out leaflets, she would address anyone in uniform as “General” or “Admiral.” Even the toughest patriot had to smile at this energetic sprite’s cheerful irreverence. It did not mean they took the densely written anti-militarist tract she was handing out, but sometimes just getting them to smile was more important. Someone once gave her a sweatshirt that said “Because I’m the Mom, that’s why,” which she wore to shreds when we were little. It fit her fierceness to a tee. Yep, the world knows her as Elizabeth McAlister, Harrisburg co-conspirator, member of the Religious of the Sacred Heart of Mary, wife of Phil Berrigan, Plowshares activist, retreat leader and so much more. We just call her mom and pretty much try to do what we’re told. Why? Because she is the mom. I still rely on her fierceness. When I sunk $1,000 into a lemon of a car, she took me to the mechanic and convinced him to give me my money back and keep the car. I was floored that he actually agreed to it and shook by her power. And I was a full on grown-up at the time, ready to walk away from $1,000 the same way I had wanted to walk away from my bike all those times. She doesn’t keep track of her arrests, doesn’t keep score like some movement-heavies, doesn’t worry about herself at all under arrest or in jail or prison. She did two years for a Plowshares action when my brother and I were in our tweens, and our sister was 3 years old. Those were hard years for her, to be away from us and our dad. But she made it seem like a retreat — she quit smoking, did yoga, went for long walks, worked on the grounds crew and built lasting friendships. All the while, she knew more about our daily activities, triumphs and tribulations from the Alderson Federal Prison Camp than most moms while living under the same roof as their kids. But now that I am older, I have a better sense of how hard it was for her to be away from us by watching her struggle with my sister’s and brother’s arrests and know that she has struggled with mine as well. We can’t tell her, “Oh, no big deal. It’s just a little arrest.” She knows — better than most — what it takes to cross the line. I happened to be in Baltimore with her when my sister rappelled off the side of the TransAmerica building in Los Angeles to hang a banner for the Rainforest Action Network. Kate had told my mom when it was going to happen and gave her the number for one of the organizers just in case. I think her name was Hillary. I remember it because we called her a lot, and mom thought about calling her more. She was praying so hard for Kate to be safe. Mom has never liked heights — an occupational hazard of a third career as a housepainter with a fearless housepainter husband. So much for the first line of this piece. I guess I should have said, “My mom is fearless… except for heights!” Still, mom invoked our dad’s ladder-climbing, height-defying spirit while Kate was harnessed in — being buffeted about by the Los Angeles winds. She is a guide, a shepherd, a midwife, a facilitator. When dad was diagnosed with cancer in fall 2002, she gathered us all in — not just my brother and sister and I, but the whole community, as well as whole other communities. Hundreds of people came to take care of him, of us, of one another — to help him die and help us grieve. And through it all, she made it happen — laughter, tears, meatballs, memories, roses, torches. There was a role for everyone because she shared it. I have seen her cry only a few times. Once was in complete and total frustration at my brother and me. I remember that like it was yesterday. It was terrifying (and strangely empowering too). She also broke down at my dad’s grave, as he was being lowered into it, with the torches and snow and music evoking some sort of timeless Viking ritual. She broke, and then she began to remake herself. For the last 10 years, she has been continuing — the life of community, of labor, of prayer, of organizing, of resistance, of studying the Bible. And she has been innovating — art has taken up residence as she devotes time and energy to her prodigious gifts. Donkeys and goats and llamas and guinea fowl now quarrel and push one another at feeding time. Five incredible youngsters call her grandma, showering her with sloppy kisses and clumsy drawings and pawing her with sticky hands. She wears her “Grandmothers for Peace” sweatshirt like a banner — fiercely and with great love. Great article Frida. I remember the arrest pictured in the photo above. I was with the group getting arrested that day. Yes, your mom, Liz is fearless! What a wonderful tribute to your strong yet tender Mom. Thanks so much for this personal testimony. Blessings for you and your family, obliged. Maybe a lot of us should call her the day we are risking arrests since Liz certainly “mothered” me into my life of resistance. Thanks for the memories. Liz, connect with your Patrick stone within and then to the spirit for peace on Mother’s Day. What a wonderful article; the author’s appreciation of her mother is so inspiring. As a 72-year old mother, grandmother and great-grandmother, I learned much by reading it. Frida, your understanding of activist peacemaker family life is a gift to the movement …. Informs and strengthens the rest of us ….. And it is such fun to read…there is joy in it…thank you. …… Liz has become in the last few years even more the inspiring and creative teacher of Biblical lessons for activist peacemakers , as I witnessed at Kirkridge. She made me laugh and cry and share her words with others.